Hat tip to Steel Pulse! Positive online buzz for cars and trucks doesn’t necessarily translate to volume sales, period. Turns out that BrandIntel has been monitoring 450,000 comments over the past year. Comments made by “enthusiasts” in consumer discussion forums on auto-information sites such as Edmunds.com, newspaper and magazine sites, and blogs. Let’s look at the print/paper analogy. This is the equivalent counting the number of press-clippings in the trade mags. As a measure of PR efficacy of getting stories published, it worked great. As an indicator of sales, it didn’t. What matters in print and online is the credibility of the messenger and the size of the audience. A story in Rupert Murdoch’s WSJ or the NY Times may have a dramatic impact compared to the same story in your local rag. Online, credibility and audience-size still matter, but so does findability. How easy is the story to find? Does it come up high in Google and to a lesser extent Yahoo? If there is buzz, is the buzz on a hub or a backwater site? Is it getting attention or play through links from other noteworthy sites? How does one measure that? There is a way – ecosystem relevance – which measures the position and rank of a site within its industry/category ecosystem. A viable, sustainable economic model is crucial for the future of the planet. Tell ’em, C.K.! His point is that Starbucks becomes the indulgence of someone who has just traded down to a small rental apartment. Gone are the days of $4.00 coffee just for the heck of it. From my own observations at the local Target, I see far more customer buying ICEEs rather than Starbucks coffees. This is the “threat of substitution” that is always around the corner, no matter how good your product is. Seems like the days of mass-luxury are over. So where does retail find its consumer, er, citizen? Turns out they’re not citizens at all – you’ve got to sell overseas. India and China are experiencing a huge boom in luxury, thanks to an explosion in middle class prosperity. The fortune is in the middle and the bottom of the pyramid. And if you can’t reach those consumers? I wrote about that in an earlier post about advertising in a recession. I was talking to Bill Dunk this morning, and we got to the topic of trust as an issue in global business. I told him I’d seen a video in which Jeff Immelt said something to the effect that in China the concept of win-win is an issue, whereas India is much better at partnerships. Immediately, Bill dug up this article for me – an interview with Nani Beccalli-Falco, GE International’s chief executive. Why do you claim that “Trust” is the key leadership competency of the new global economy? Covey: If you look at the nature of the world today, a foundational condition in Thomas Friedman’s flat world is the presence of trust. Put simply, today’s increasingly global marketplace puts a premium on true collaboration, teaming, relationships and partnering, and all these interdependencies require trust. In the book I point out that partnerships based on trust outperform partnerships based on contracts. Compliance does not foster innovation, trust does. You can’t sustain long-term innovation, for example, in a climate of distrust. 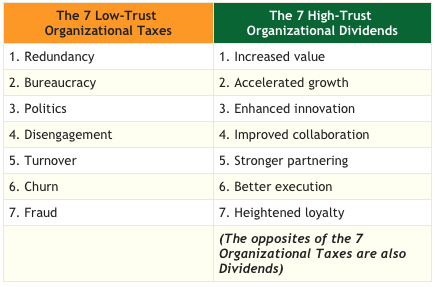 In issue after issue, the data is clear: high trust organizations outperform low-trust organizations. Total return to shareholders in high trust organizations is almost three times higher than the return in low trust organizations. So we assert that trust is clearly a key competency. A competency or skill that can be learned, taught, and improved and one that talent can be screened for. Trust is the one thing that affects everything else you’re doing. It’s a performance multiplier which takes your trajectory upwards, for every activity you engage in, from strategy to execution. How do you identify a high-trust or low-trust organizations? Another very visible indicator is the behavior of your customers and suppliers. What is your customer churn rate? Do you have a history of long-term customer and supplier relationships? What is your reputation or brand equity in your marketplace? These behaviors are all taxes on performance. The work we do is to establish trust as your organizational operating system. That’s a high-tech metaphor, but it’s appropriate. We know how trust works, how to measure it, how to establish it, grow it, extend it, and sustain it – with all stakeholders. Why is trust such a hidden variable to many otherwise competent managers? Covey: Unfortunately, too many executives believe the myths about trust. 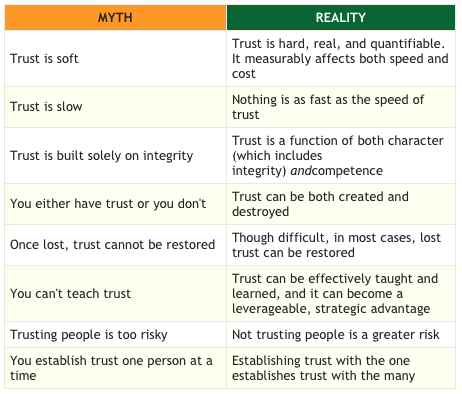 Myths like how trust is soft and is merely a social virtue. The reality is that trust is hard-edged and is an economic driver. For instance, strategy is important, but trust is the hidden variable. On paper you can have clarity around your objectives, but in a low-trust environment, your strategy won’t be executed. We find the trust tax shows up in a variety of ways including fraud, bureaucracy, politics, turnover, and disengagement, where people quit mentally, but stay physically. The trust tax is real. So trust is measurable? quantifiable? Covey: Absolutely, trust is measurable. 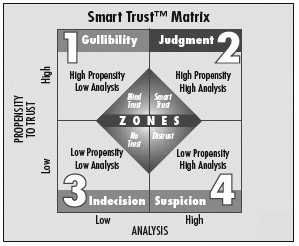 Smart organizations measure trust in three key ways: 1) actual trust “levels”; 2) the “components” or dimensions that comprise trust; and 3) the “effects”, or impact, of trust. We have found that one very simple way to measure trust levels is to ask one direct question and roll it up and down throughout the organization. For internal stakeholders ask: “Do you trust your boss?” to employees at all levels of an organization. For external stakeholders, like customers or suppliers, you might ask them: “Do you trust our sales representative or account manager?” These are simple, direct questions that tell us more about our culture than perhaps any other question we might ask. What are the competencies, the behaviors that build trust? Covey: Trust too often has been pigeonholed as based on character and integrity alone. There’s nothing wrong with that, and that is clearly the foundation, but it’s insufficient. Trust is a function of both character and competence. Of course you can’t trust someone who lacks integrity, but hear this: if someone is honest but they can’t perform, you’re not going to trust them either. You won’t trust them to get the job done. That’s one reason why trust has a soft image- because it has been severed from competence and results. So how does one apply trust to branding? Covey: When I look at a brand, a brand is nothing more or less than trust with the customer, trust with the marketplace. The principle behind a brand is reputation. The brand stands for a promise and the ability to deliver on that promise. And in that promise is a company’s character and competence, its reputation. From the character side you start with integrity–honesty, congruence, humility and courage. The courage to be open, to stand for something, to make and keep commitments. Then there’s intent–is there a genuine concern for people, purposes and society as a whole or is profit your sole motive? What’s the company’s agenda? And how does it behave? Sometimes poor behavior is simply bad execution of good intent. On the competence side, you start with your capabilities–talents, skills, the ability to deliver. Is your company staying relevant, are you continually improving, do you have the right technologies to stay ahead of your competition? Brands need to reinvent themselves from time to time to stay relevant. Finally, look at your results. Your company and your brands are constantly measured based on past performance, present performance and anticipated future performance. These four dimensions–integrity, intent, capabilities and results–make up the credibility and reputation of your brand. When the trust is high, you get the trust dividend. Investors invest in brands people trust. Consumers buy more from companies they trust, they spend more with companies they trust, they recommend companies they trust, and they give companies they trust the benefit of the doubt when things go wrong. The list goes on and on. On the Internet, a trusted brand versus an untrusted brand–the differences could not be clearer, you only give your credit card number to those you trust. And look what happens when a brand gets diluted or polluted or compromised, we see how fast consumers, and investors, turn away. They quit buying. These same principles apply equally to companies and individuals. What about the social responsibility of business? Is this part of the trust equation? Covey: Initially many companies may move into this arena for PR purposes. More out of fear of not being in the arena, than really participating with their souls. But there are huge benefits that flow from this – the difference it makes with your employees first, then your customers, your suppliers, your distributors, your investors. The distrust we see all around is suspicion, a response to the corporate scandals and vicious downward cycles of cynicism. But when a company focuses on the principle of contribution for all stakeholders, that becomes good business. Executives need to understand the economic benefits of this trust dividend, especially when the behavior is real, not artificially or superficially created as PR to manipulate trust. We will see more and more companies moving in this direction because it makes economic sense, period. Trust varies by geography, as you’ve pointed out in your book. How do companies build trust globally? Covey: There’s no question that trust issues are global issues. There’s also a country tax. The Edelman Trust Barometer tells us, for example, that trust is often based on country of origin. US companies are being taxed in Europe, in Germany, France and England, for example. How can companies like UPS improve their trust rankings? Companies need to have a strong promise, because the promise builds hope. Keeping the promise is what builds trust. My father has an expression: “You can’t talk yourself out of a problem you behaved yourself into.” So it is with trust. Sometimes it takes a little time, but you can accelerate the process by declaring your intent and signaling your behavior, so others can see it. People and companies can learn these behaviors. It’s not a simple process which happens overnight. But it is a systemic, cultural process which can happen one leader at a time, one division at a time, one company at a time, and you can see the behavior shifting toward authentic, real trust-building behaviors as opposed to the more common counterfeit behavior of spin and hidden agendas and the like which tend to dissipate and diminish trust. Covey: One thing about trust is that everyone’s for it. However, there are three big objections which come up. The first one is that trust is a social virtue, to which I say no, it’s much more than that; it’s a hard-edged economic driver. Secondly, and we hear this all the time: “we can’t do anything about trust, it’s either there or it’s not there.” This too is a fallacy. Trust is a competency. It’s something you can get good at. It’s a strength you personally, and your team and your company can master. Being good at it will elevate every other strength you have. The third complaint goes along these lines: “We’ve been burned before. We can’t trust everyone. Are you suggesting we trust everybody?” That’s where I suggest you exercise what I call “SmartTrust.” Most leaders have been burned before, so they become distrusting. Our society is that way. After Enron and WorldCom, we pass legislation like Sarbanes-Oxley to force compliance, raising the “tax” on all businesses. The question is, “is there a third alternative?” An alternative where you combine a high propensity to trust with good analysis and judgment, so we can really assess the circumstances, the risk, the credibility of the people involved, so we can extend trust, and build into that trust a stewardship or responsibility. If you’re not trusted, you tend to reciprocate with distrust. That’s how the vicious cycle of mistrust starts and spirals downward. There is a risk in trusting people, but the greater risk is not trusting people. SmartTrust says you look at the opportunity, the risk and the credibility of the people involved. And you add to that verification and analysis. So you trust and verify. As opposed to verify, then trust! Let’s look at Berkshire Hathaway and Warren Buffet. I mention them in the book as an example of a high-trust company, about the acquisition they made based on a hand shake without due diligence. But did you know that’s how the entire company operates? Why? Because they choose to operate in a “seamless web of deserved trust” as Charlie Munger calls it. This is real. It’s not blind trust, but smart trust. Seth Godin helps you wake up… you can’t be average anymore. The December 2007 HBR had an interesting article by Kevin Coyne called Breakthrough Thinking from Inside the Box. There’s far more to this article than just the 21 questions, so I urge you to go grab it here! Which customers use or purchase our product in the most unusual way? Do any customers need vastly more or less sales and service attention than most? For which customers are the support costs (order entry, tracking, customer-specific design) either unusually high or unusually low? Could we still meet the needs of a significant subset of customers if we stripped 25% of the hard or soft costs out of our product? Who spends at least 50% of what our product costs to adapt it to their specific needs? Who uses our product in ways we never expected or intended? Who uses our product in surprisingly large quantities? Who else is dealing with the same generic problem as we are but for an entirely different reason? How have they addressed it? What major breakthroughs in efficiency or effectiveness have we made in our business that could be applied in another industry? What information about customers and product use is created as a by-product of our business that could be the key to radically improving the economics of another business? What is the biggest hassle of purchasing or using our product? What are some examples of ad hoc modifications that customers have made to our product? For which current customers is our product least suited? For what particular usage occasions is our product least suited? Which customers does the industry prefer not to serve, and why? Which customers could be major users, if only we could remove one specific barrier we’ve never previously considered? How would we do things differently if we had perfect information about our buyers, usage, distribution channels, and so on? How would our product change if it were tailored for every customer? Which technologies embedded in our product have changed the most since the product was last redesigned? Which technologies underlying our production processes have changed the most since we last rebuilt our manufacturing and distribution systems? Which customers’ needs are shifting most rapidly? What will they be in five years? One of Ram Charan’s recent attempts to change the world is entitled: Know-How: The 8 Skills That Separate People Who Perform from Those Who Don’t . It’s not just another one of those “I-worked-with-Jack-Welch- and-Larry-Bossidy-so-step-aside fool” books, but rather serves to create a modern day Ben-Franklin list of virtues based on performance. 1. Positioning and Repositioning: find ideas for the organization that meets customers’ demands and makes money. 2. Pinpoint External Change: identify patterns that place the organization on the offensive. 3. Leading the Social System: get the right people with the right behaviors and the right information to make better decisions and business results. 4. Judge People: assess people based on their actions, decisions and behavior and match them to the job’s non-negotiables. 5. Mold a Team: The ability to coordinate competent, high-ego leaders. 6. Set Goals: balance goals that give equal weighting to what the business can become and what it can achieve. 7. Set Priorities: define a path and direct resources, actions, and energy to accomplish goals. 8. Deal with Forces beyond the Market: deal with pressures you cannot control but which affect your business. Charan also identifies personal traits of leaders that help (or hurt) these “know-hows”. 1. Ambition: the drive to accomplish something but not win at all costs. 2. Tenacity: The drive to search, persist and follow through, but not too long. 3. Self-confidence: The drive to overcome the fear of failure and response, or the need to be liked and use power judiciously but not become arrogant and narcissistic. 4. Psychological Openness: The ability to be receptive to new and different ideas but not shut other people down. 5. Realism: The ability to see what can be accomplished and not gloss over problems or assume the worst. 6. Appetite for Learning: The ability to grown and improve know-hows and not repeat the same mistakes. Well, what’s not to like? This sort of checklist is usually what the HR people hand out in those 360 degree-assessments which are supposed to separate the good leaders from the bad leaders. The problem is – it’s too easy for a bad manager to do well on these things, by using some old-fashioned fear and coercion on his subordinates. The seven personal virtues relate to your attitudes toward activities and their challenges. Good personal character traits will better your chances of success in achieving your goals. 2. Order: Let all your things have their places; let each part of your business have its time. 3. Resolution: Resolve to perform what you ought; perform without fail what you resolve. 4. Frugality: Make no expense but to do good to others or yourself; i.e., waste nothing. 5. Moderation: Avoid extremes; forbear resenting injuries so much as you think they deserve. 7. Cleanliness: Tolerate no uncleanliness in body, clothes, or habitation. These six “social virtues” concern your attitudes toward people with whom you have dealings. Good social character traits result in other people wanting to do business with you or to just hang out with you. 8. Tranquility: Be not disturbed at trifles, or at accidents common or unavoidable. 9. Silence: Speak not but what may benefit others or yourself; avoid trifling conversation. 10. Sincerity: Use no hurtful deceit; think innocently and justly, and, if you speak, speak accordingly. 11. Justice: Wrong none by doing injuries, or omitting the benefits that are your duty. 12. Chastity: Rarely use venery but for health or offspring, never to dullness, weakness, or the injury of your own or another’s peace or reputation. I think I like old Ben’s virtues a bit more. Looks like Ram Charan’s been reading up on Ben Franklin, though, doesn’t it? Which reminds me – what happened to Dr. Deming’s 14 points?